It’s been quite a while since I have been back to Rome. And at first it didn’t look like the weather was going to cooperate all day. Dark, grey, overcast skies with on and off down pours. Finally in the last evening, some of the skies broke and we had amazing color hit the clouds. One of the tricks for travel photography is to have gear that you are comfortable carrying with you in your luggage and as you walk around the city. I try to limit the use of a tripod to have to carry it around. Second, since I only travel with a carry-on bag, I need a camera that can fit in with my cloths. In this case I was giving the new Nikon Z 7 with the Z 24-70 lens a go as my travel camera. 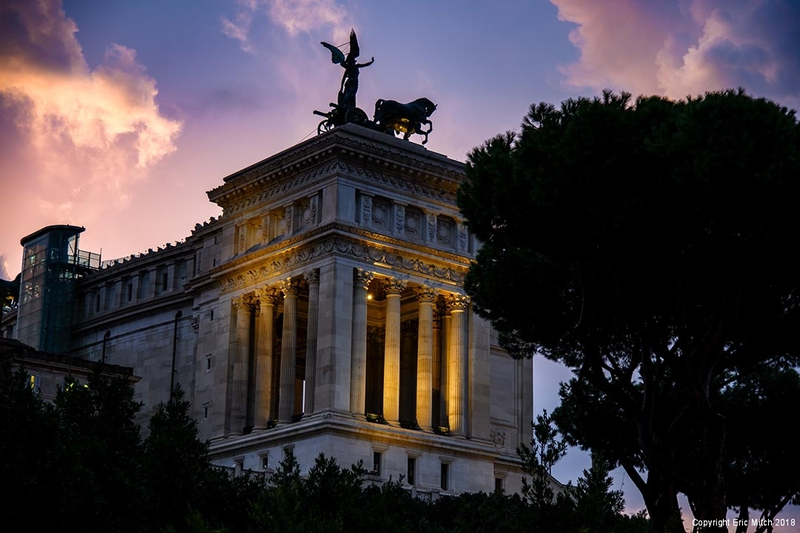 As you can see here with the Altare della Patria, it worked out great. The saying goes, the best camera to use is the one you have. In this case, the new Z7 is small, night, and can travel with me. So for me it works great.